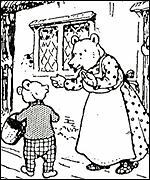 Rupert Bear can rightly claim to have enjoyed a more continuous and extensive popularity than any other humanized, fictional animal. He first appeared in 1920 and his adventures continue up to this day and in 2005 he will celebrate his 85th Anniversary. 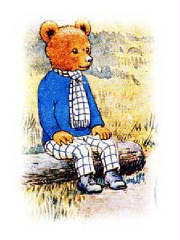 It may be hard to believe, but a certain little bear called Rupert really is celebrating his 85th birthday this year. He's six years older than Winnie The Pooh and eight years older than Mickey Mouse, which makes the famous white bear the longest-running children's comic character in the world. Created by artist Mary Tourtel, he started life in the Daily Express on 8 November, 1920. His adventures have since been immortalised in books - 50 million copies have been sold worldwide - and on the small screen.His TV series has been syndicated to 28 or more countries. When the Rupert cartoons first appeared they were an overnight success. Rupert and his friends - Bill Badger, Algy Pug and Pong Ping - achieved celebrity status. 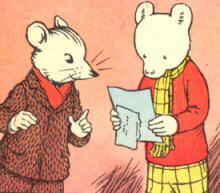 A fan club - The Followers of Rupert Bear - was set up then and is still active today. There are over 1,200 members. 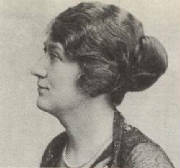 After Mary Tourtel retired in 1935, Alfred Bestall took over - for the next 30 years. 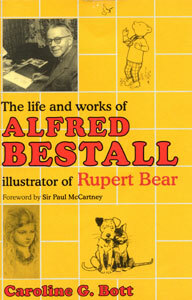 Bestall came up with another 270 adventures and was still illustrating the stories up to the age of 90. Rupert's timeless qualities have won the admiration of several celebrities, including Sir Paul McCartney, actor Terence Stamp and author and former Monty Python star Terry Jones. In 1984, Rupert even starred in Sir Paul's short animated film, Rupert And The Frog Song, which won a British Academy Award. Rupert still continues to run in the Express while his annuals are still hugely popular. Eight decades after his initial success, Rupert is still going strong.